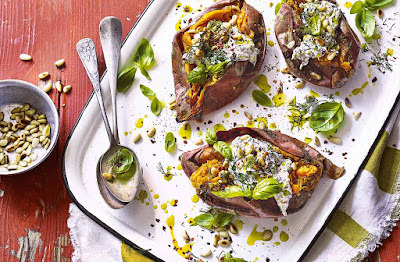 These herby sweet potatoes are the perfect veggie addition to a barbecue. 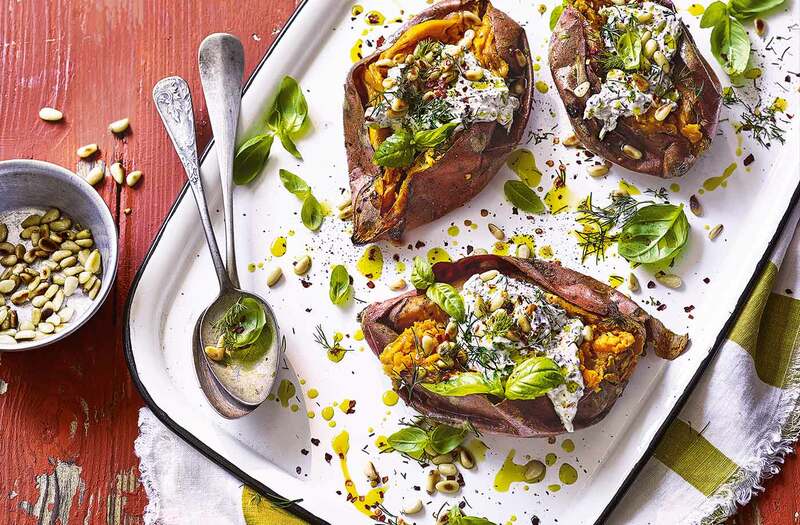 Topped with creamy garlic, tahini and herb yogurt and crunchy pine nuts, they can be served as a vegetarian main or as a hearty side dish. the potatoes for 45-50 mins. Meanwhile, mix the tahini, yogurt, garlic and most of the herbs in a bowl. Toast the pine nuts in a frying pan over a medium heat for 2-3 mins until golden, shaking the pan regularly. Remove from the pan and set aside. Cut a slit length-ways into the sweet potatoes and pinch each end to create a cavity. Add a dollop of tahini yogurt. Sprinkle over the pine nuts, crushed chilies, remaining herbs, some seasoning and a drizzle of oil to serve. Tip: Short on time? Prick the potatoes with a fork and microwave on high for 8 mins until just tender. Cover with foil and barbecue for 15 mins, turning once.